How many times have you forgotten items from your grocery list because it was so unorganized? Too many times to count, right? Well, the solution is simple. 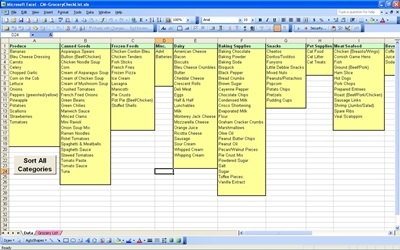 By using the Excel grocery list template, your shopping will become so much easier. You’ll have more time for the more important things in your life, such as family and friends. The Excel template for your grocery list provides you with a well organized document that you fill out to take with you to the grocery store. The template is organized by categories, which is most beneficial to you as a shopper who wants to be finished as quickly as possible with their grocery shopping. Produce, canned goods, frozen foods, miscellaneous, dairy, baking supplies, snacks and meat/seafood are several of the categories you will find on this Excel template. As you can see, this makes grocery shopping much easier and quicker. Just imagine the time it will save on your shopping trips. By having a template that is divided into specific categories that are pinpointed to grocery stores, you can do your shopping in a more organized manner. For example, all the meat you need is going on be in the meat/seafood category and all meat is located in the same section in grocery stores. By having and using the template, you have all of those items needed in that particular category right there together. So, the days of passing up one section of the store to only get to the bottom of your list to find you must turn around and go all the way to the other side of the store are over! This problem that has plagued grocery shoppers everywhere has essentially been eliminated with the use of the Excel grocery shopping template due to the template being formatted with the categories found in grocery stores. It is truly an original idea.